The idea of inbound marketing can be intoxicating. The thought of becoming a trusted advisor by creating compelling content is amazing. Ranking high on Google and having your content shared across social media is enchanting. And the thought of attracting qualified leads who have expressed an interest in your product is enough to make any CEO start doing cartwheels right down the office hallway. The intoxication, enthusiasm, and gymnastics all begin to wain when people stare at the blank screen. There is just something so intimidating about that blinking black line. Creating a high volume of helpful content that drives readers to action can be overwhelming. But it doesn’t have to be like this. Effective inbound marketing campaign planning allows you to break-up your marketing strategy into controllable and measurable chunks. How do I define an inbound marketing campaign? An inbound marketing campaign is a collection of online and offline marketing activities that direct the reader toward a desired conversion. This activity is typically a content offer download. It could also be an event registration, course sign up, or demo request. With each of these three metrics in place, you can make strategic decisions during and after your campaign to improve your effectiveness. 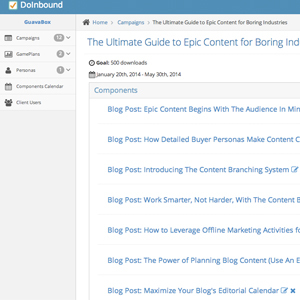 A marketing automation tool like HubSpot makes it easy to tag each published component with a campaign tag. This helps you measure the collective impact of your campaign against your goals. What elements go into an inbound marketing campaign? An inbound marketing campaign is made up of a coordinated collection of components. A component is any marketing asset that is live on your website. Effective inbound marketing campaign planning brings these components together, line them up with the shared goal of promoting the central content offer, and deployed to world. The key to remember is that each component needs to have a clear call to action. This call to action needs to be measurable and have a real bottom line impact for your company. Getting more Facebook likes or YouTube video views is not a sufficient goal for an inbound campaign. How can I do inbound marketing campaign planning the right way? There is a system to creating an inbound marketing campaign that provides content that is relevant to the content offer and attracts quality leads. It is a system that we use for each of our clients and for ourselves. We’re using it right now as we write this post. It is called the Content Branching System (CBS). The CBS starts with the persona first. It is only with a detailed understanding of your buyer personas that you can create content offers like eBooks, white papers, checklists, and webinars that are truly helpful. Thinka bout the pains they’re feeling and the questions that they’re asking. Use your content offers to provide your company as a trusted resource. Be authentically helpful. Share advice as an industry expert, rather than a company sales person. By starting your campaign with these cornerstone content offers, it becomes easier to identify components that can promote the offer. Take blog posts for example. They are one of the best promotional tools for content offers because they’re indexed by Google and frequently shared on social media. Once you have your content offer created, go back through the offer and pull out topics that can be explained in greater depth in a blog post. Perhaps there is an opportunity for greater detail, more examples, or a real life case study. By working off of the cornerstone content offer, you make sure that each component is highly relevant to the call to action associated with the campaign. This means that your conversion rates will increase because you’re providing the reader with a consistent experience based on their interest.